Unlike iPhone cases, I love iPhone docks. With the amount I use my iPhone, resting it in a proper, elegant throne at the end of the day only seems fair. It’s more than just aesthetics to me. When I turn over at 3:00AM as a half-zombie to check how much longer I can sleep, it’s far easier — and safer, with the glass of water on my nightstand — to have my iPhone docked and the screen pointed in my direction. I’ve spilled that glass of water more times than I can count, but have yet to do so with my iPhone in a dock. Docks work great on a desk as well. We all can agree that extra wires and clutter on your desk can be unnecessarily distracting. An iPhone dock eliminates all that extra cruft. When I was asked to test a variety of the best docks on the market, I couldn’t say no. Over the last few weeks, I’ve tried six different iPhone docks with six different sets of features and qualities. I’m now convinced that not just any dock is good enough to house my iPhone each night. I have quickly come to realize what I value in an iPhone dock and what I find superfluous and unnecessary. I’m also willing to bet my needs will be fairly standard across the board. First though, let’s see what those needs are. 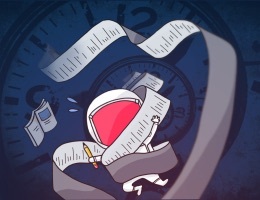 The list of feature requests here could be endless, but these are a few I focused my attention on over the last few weeks. Design and Build Quality: This is a no-brainer on the front, but I was surprised at the wide variety of dock designs and the equally wide variety of build qualities when doing this test. Some docks in this list were clearly made with a visual aesthetic as the primary purpose, while others were made for stability and support purposes. In my book, the perfect iPhone dock is going to combine looks and stability for your iPhone. 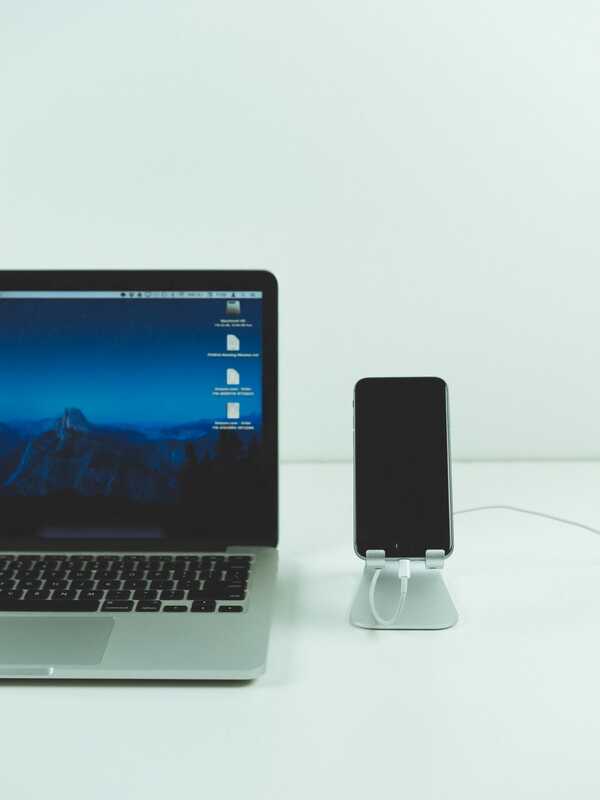 Support and Stability: As mentioned above, an iPhone dock isn’t much good if you feel worried each time you connect your iPhone at the end of the day. If the iPhone just rests on the connector, can a bleary-eyed, half-asleep person rely on it to stay put when they reach for it? Can you tap your iPhone screen with your index finger and know you won’t accidentally topple the dock? And, as an added bonus, can the dock support larger iOS devices like the iPhone 6s Plus or the lineup of iPads? 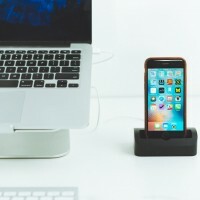 The perfect iPhone dock will keep your iPhone stable when tapping it or reaching for it in its dock and may even have the ability to rest your iPad in it as well. “Stay Put-ability”: This is much along the lines of support and stability, but I found this feature to be one of my most important requirements. When you reach to undock your phone in the morning, does the dock stay put? Or does it require one hand to remove the dock and a second hand to keep the dock situated on your desk or nightstand? People’s needs may differ here, but the perfect iPhone dock for me will only require one hand to dock and undock an iPhone at the beginning or end of each day. Case Compatibility: Unlike me, people love to keep their iPhone protected with a case or screen protector. Unfortunately, those cases create havoc for iPhone dock makers. With such a wide range of cases and case sizes, creating a dock that can house a cased-iPhone seems like an unbearable task. The perfect iPhone dock will be able to handle standard case sizes, like our favorite, the Apple Silicone case. 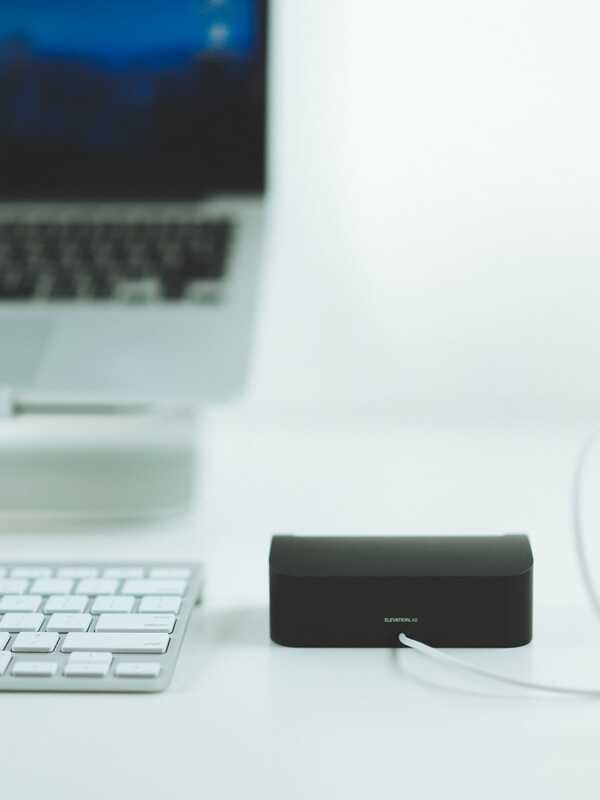 Speaker Compatibility: Sometimes people like to dock their iPhone away from their desk and nightstand, like on an entertainment unit or a shelf with external speakers. From the beginning, Apple’s iPhone docks have had line-out capabilities to hook up to standard audio jacks. In my opinion, the perfect iPhone dock will have the ability to hook up to a standard speaker system with relative ease. Future-proofing: Whether we like it or not, Apple is sure to introduce a new iPhone every year. Buying a new iPhone each or every other year often results in having to buy new cases and new docks to fit the new iPhone’s shape. This can be hard on the pocketbook and we need to eliminate extra spending where we can. So, the perfect iPhone dock will be capable of docking more than one generation of iPhone, be it the iPhone 5s or the future iPhone 7. Cable Included: This was a relative non-issue for me until I had to test a wide range of docks. Apple’s iPhone ships with a standard Lightning cable, but that cable can be used in a plethora of areas. 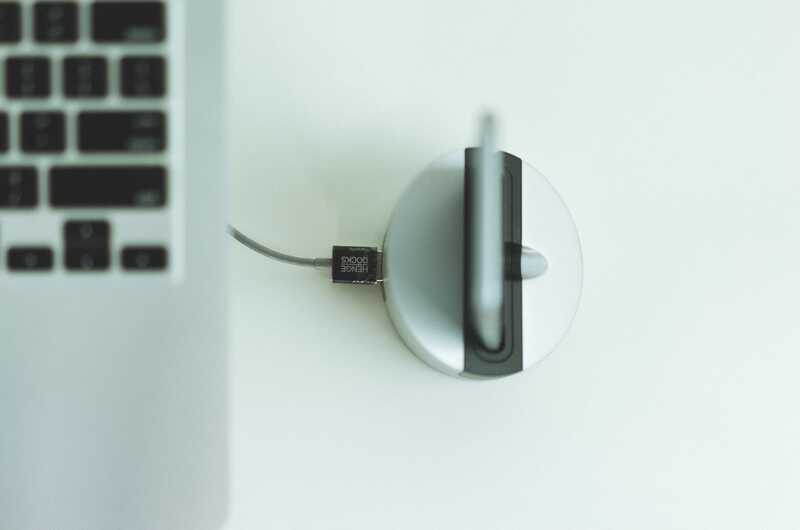 By latching it to your dock, you are eliminating the ability to use that Lightning cable in your car or to plug into your computer at the office. The perfect iPhone dock will ship with its own Lightning cable to eliminate having to use the one I already have. ”No-Lookedness”: I’m not sure of a better term to use to describe such a feature, but this may just be a Josh Ginter special. I’m a big fan of being able to dock and undock my iPhone with one hand, but I’m an even bigger fan of being able to dock and undock my iPhone without looking or in the pitch black of night. The perfect iPhone dock will get bonus points from me if I can dock my iPhone on my nightstand in the darkest part of night without causing a ruckus and without waking up my light-sleeping wife. This is a pretty exhaustive list of features to test. It may even be an overdone list of features, but I was pleasantly surprised to find two of the docks to check almost every box. Companies are capable of creating a perfect dock with a wide range of features for everyone. We may not be there yet, but we are very close to being able to buy a single dock that works for every iPhone and iPhone/case combination, both currently and in the future. The original ElevationDock was a Kickstarter phenomenon, and the latest ElevationDock 3 claims the top spot on our list of docks for the iPhone 6s and 6s Plus. The ElevationDock 3 checks almost every box in my exhaustive list of requested features. 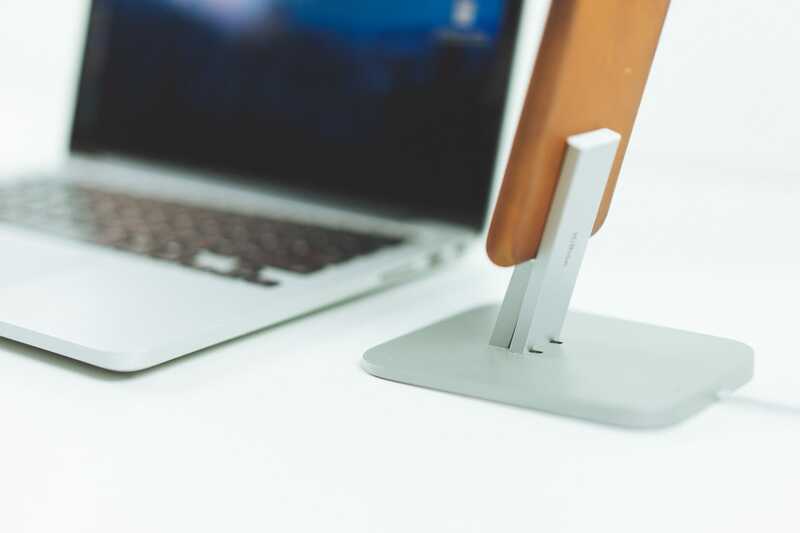 The ElevationDock 3 comes in four different colors of milled aluminum and looks phenomenal on your desk. I tested the matte black option with a space grey iPhone 6s and I think this is the coolest looking dock/iPhone combination I tested. The ElevationDock 3 excels in a variety of ways. 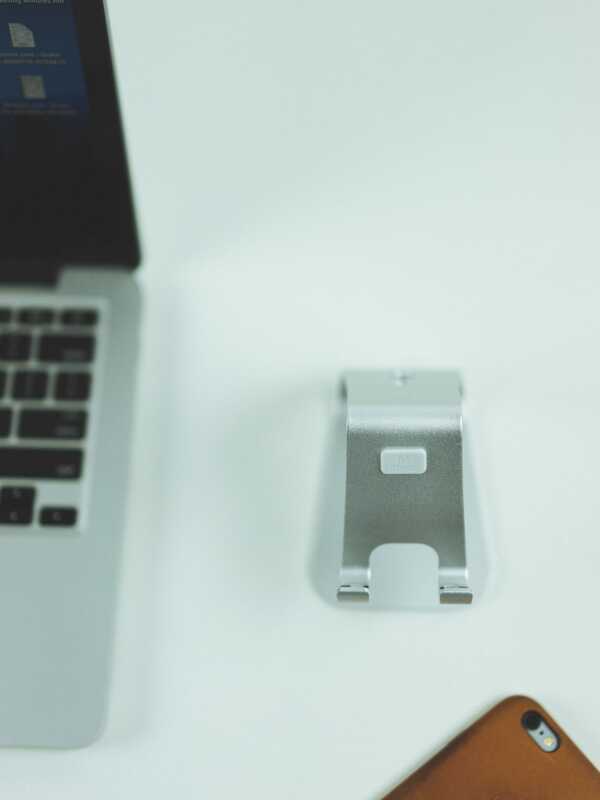 The dock’s great looks come from the solid piece of milled aluminum, which is heavy, durable, and great for providing support for your iPhone. The extra weight is also great for docking and undocking your iPhone without having the dock carried away when you’re in a hurry. However, it’s not as heavy as the Henge Dock Gravitas, meaning the ElevationDock 3 does move around a bit when undocking. Despite its all-aluminum body, the ElevationDock 3 still has the ability to cater to different iPhone cases and iPhone sizes. The large cutout is made specifically for the larger iPhone 6s Plus, but, unfortunately, is not capable of docking an iPad of any size. Resting in that cutout are three silicone bumpers, positioned to protect your iPhone from scraping against the aluminum dock. The back silicone piece is a rather nifty approach to accommodating for different case sizes. The back silicone piece pulls out and can be flipped around and inserted back into its slot to allow for a larger, thicker case. This method is quite simple, quite efficient, and a very handy way of making the ElevationDock 3 that much more applicable for a wide variety of users. The silicone bumpers are also good for docking your iPhone without looking. With an all-aluminum build and with a cutout shaped for the larger iPhone 6s Plus, it would be easy to scrape the iPhone’s body on the hard aluminum surface. The silicone bumpers help alleviate the random scrapes that might happen when you aren’t consciously docking your iPhone. The ElevationDock 3 isn’t a perfect iPhone dock, but it’s the dock that came the closest to perfection. 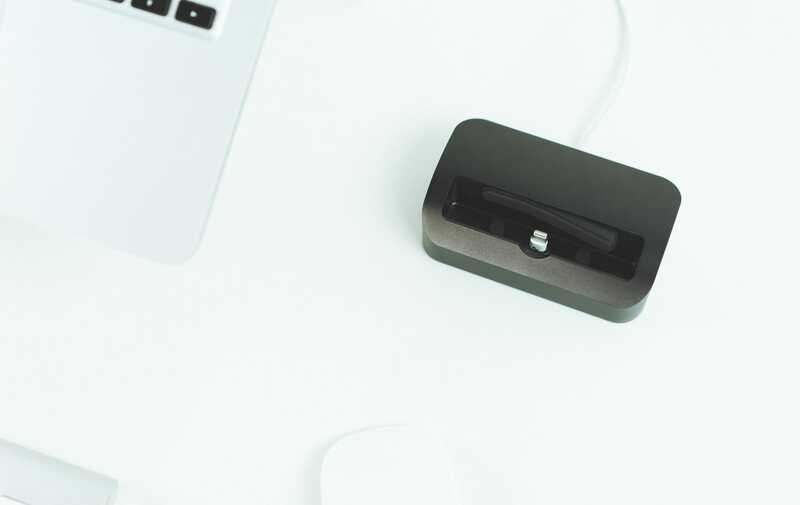 The ElevationDock 3 comes with its own Lightning cable, which is great on its own. But setting up the cable is a lesson in patience. You have to run the cable through the insert hole in the bottom of the cutout and the cable appears to be pinched when you click in the bottom cover. Further, the Lightning cable shipped with the matte black ElevationDock 3 is white, breaking the visual perfection of the dock as a whole. 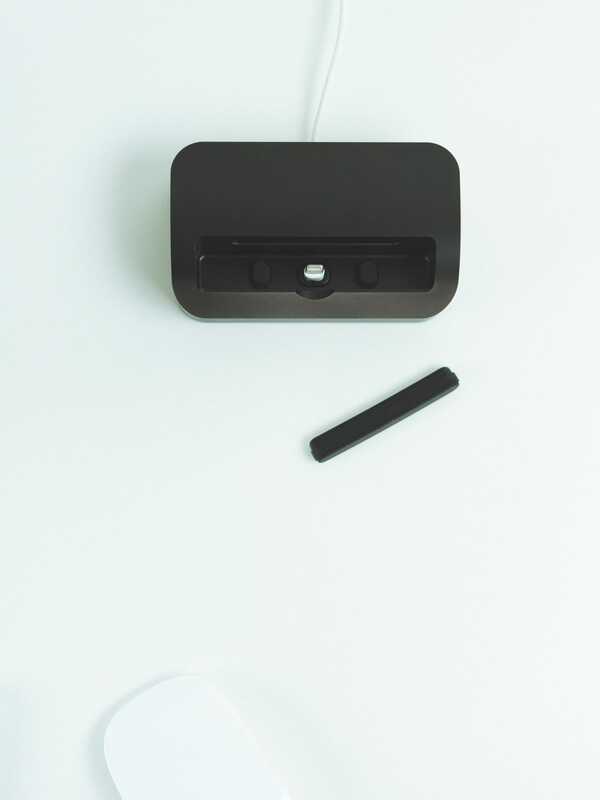 The ElevationDock 3 doesn’t have a line-out to hook up to a speaker system of any kind, instead relying solely on the Lightning connector. 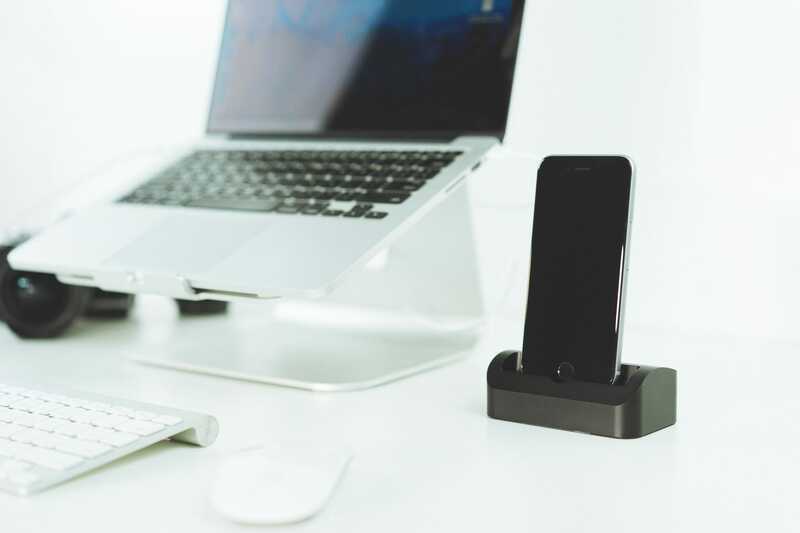 This may limit the places you use the ElevationDock 3 to your desk and your nightstand. Lastly, and entirely speculative, but it’s not immediately clear how the ElevationDock 3 would accommodate a future iPhone 7. We’ve seen Elevation Lab introduce a new dock for each generation of iPhone design so far, and the current design doesn’t leave a whole lot of room for a differently designed iPhone. These downfalls aside, the ElevationDock 3 has the best combination of looks, features, and design of all the docks tested on this list. It is the most expensive option on this list, and at $89, you may want to be sure this dock is exactly what you’re looking for. The high price is justified when you compare the build quality and the handy silicone bumpers built into the dock. 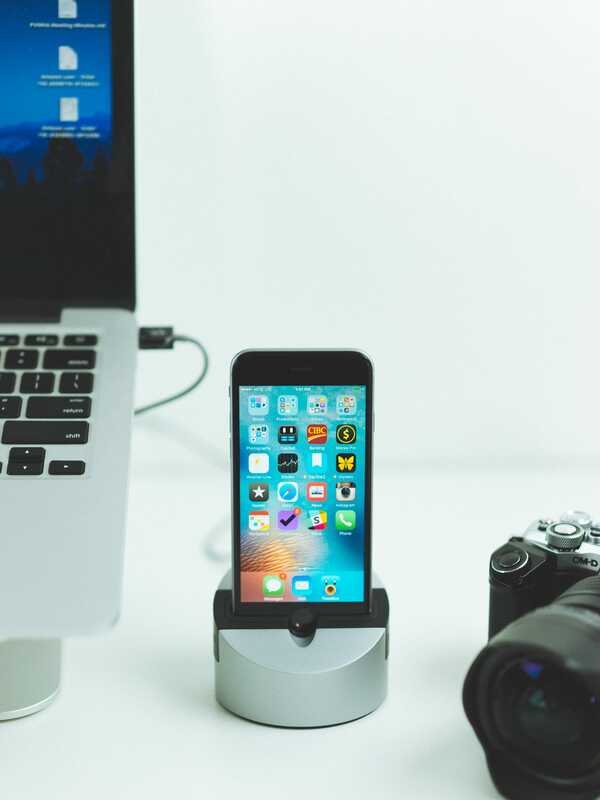 As a whole, the ElevationDock 3 is our favorite iPhone 6s and 6s Plus dock. Henge Docks came on the scene by creating one of the more unique docking options for MacBook Pros. 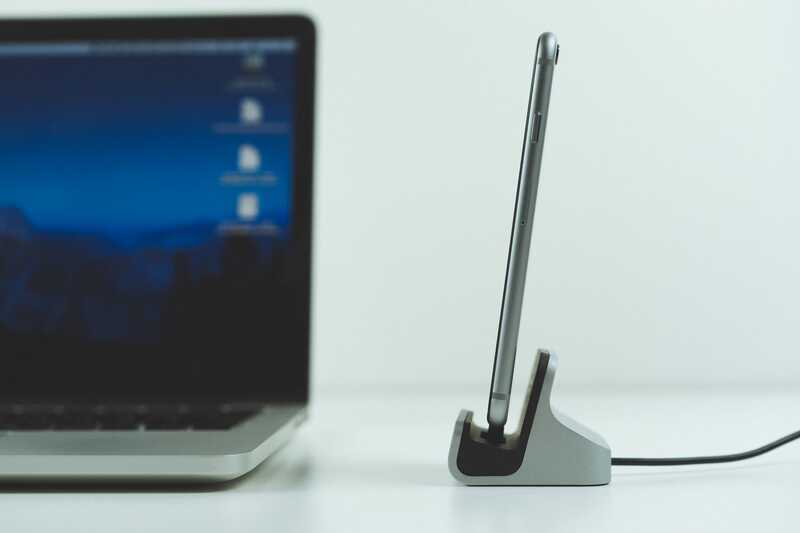 One of their relatively unheralded products is the Gravitas Dock for iPhone and iPad. The Gravitas takes the cake when it comes to the heaviest dock on this list and gets really close to taking the cake as the best iPhone dock period. Most notably, the Gravitas is a full 2.5 pounds of dead weight. This dock is heavy, allowing for you to remove your iPhone or iPad with one hand. The dock doesn’t budge when on a desk or nightstand, which is another boost with that dreaded glass of water I keep around for my late night thirsts. The Gravitas’ weight is its single biggest selling point, and the benefits that extra weight provides make it one of my favorite docks on this list. 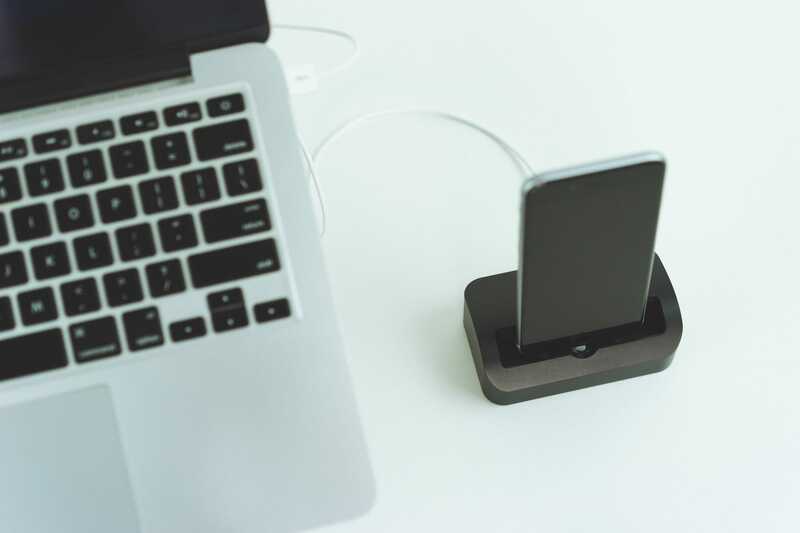 In order to accommodate multiple devices, Henge Docks ships the Gravitas with multiple hard plastic inserts that can be easily removed and inserted. Each insert has an inner lining that can be removed to accommodate slim-style cases, and the iPhone 6s Plus and iPad inserts have an extension up and away from the Gravitas body to provide a little extra support. That inner lining is a little difficult to remove, as I had to use a table knife to pry it away from the rest of the insert. It’s not immediately clear how to remove that lining in order to accommodate a case, so I was hesitant to pull out the table knife for fear of actually snapping the insert in half. Alas, everything was smooth, but I think this can be executed better. The hard plastic also makes me worry about scratching my naked iPhone if I accidentally dock my iPhone a little too quickly. I’d greatly prefer to see Henge Docks provide a silicone insert option to give that extra level of comfort and protection. These plastic inserts are Henge Docks’ way of future-proofing the Gravitas. 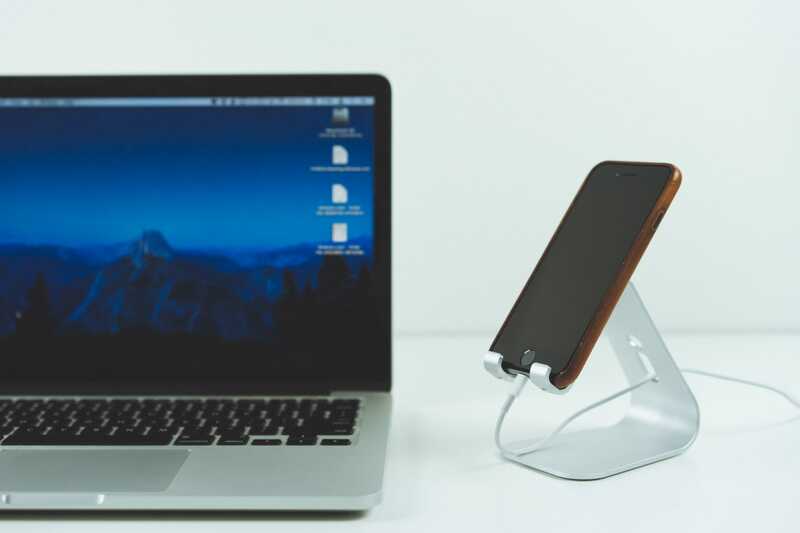 The Gravitas is supported by Henge Docks’ “Life After Device” program: Henge Docks will continue to create plastic inserts for future generations of iPhones and iPads to ensure your device can always find a home in Gravitas. My last point to be made about these plastic inserts is how they make the Gravitas my nightstand dock of choice. Because the hard plastic inserts have a very specific mould size, you can easily dock and undock your iPhone from the Gravitas without looking or during the darkest part of the night. There’s no guessing or scratching up against the hard aluminum (although there may be some friction between the iPhone and the hard plastic insert itself), and this makes it the perfect dock to have at your bedside. As mentioned, the Gravitas ships with an iPad insert as well, making for a multi-device dock if you so choose. I only had an iPad Pro to test with the Gravitas. The experience wasn’t poor, per se, but it felt immediately obvious the iPad Pro was not one of the original iPads the Gravitas was designed for. The insert was a little tight and the insert positioned the iPad Pro a little too upright for my liking. This is one of only two docks on this list that can also house an iPad, so there aren’t any real complaints in this department. However, I wouldn’t recommend using this with an iPad Pro all that often. 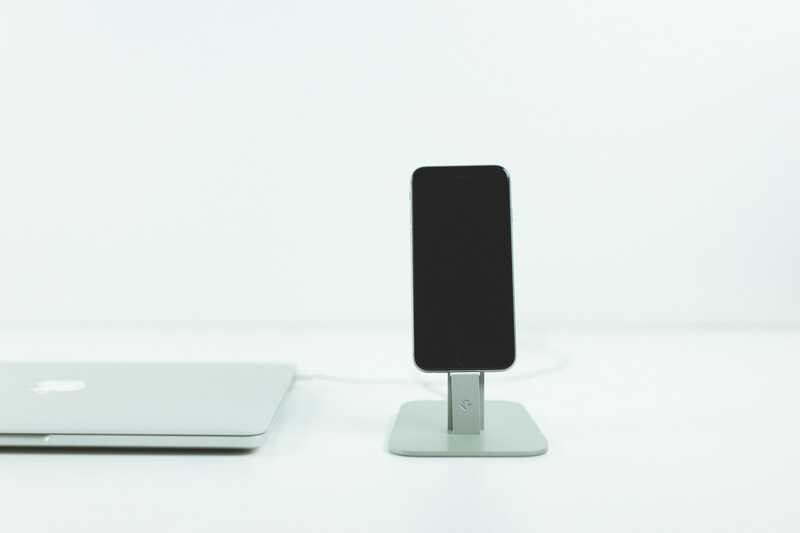 The Gravitas comes with its own USB to USB cord and doesn’t use a Lightning cable like other docks. This eliminates the ability to use the cord for other purposes, but it also frees up the Lightning cable your iPhone ships with. 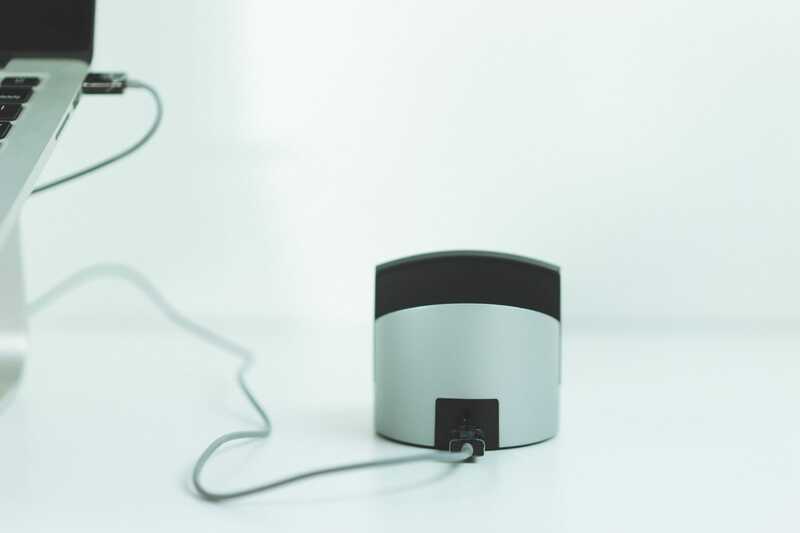 On the back side, the Gravitas has a line-out audio jack to hook up to a speaker system. This is much like Apple’s iPhone dock and the less expensive Belkin dock. I really like the Henge Docks Gravitas iPhone dock. It’s simple and doesn’t have a large footprint, but its enormous weight makes it ideal for one-handed undocking. Its hard plastic inserts give it a way to accommodate multiple sizes of devices (even an iPad), but the hard plastic is less protective for your iPhone than silicone bumpers, and the plastic inserts don’t make it immediately clear how to insert an iPhone with a case. The Henge Docks Gravitas is sold for $69 USD, which is on the higher end of the scale in this list. You can buy two of them (one for your desk and one for your nightstand, for instance) and get a 10% discount as well. Apple’s own iPhone 6s and 6s Plus dock is designed exactly how you’d expect any Apple product to be designed: minimal, and with no extra fluff. The Apple dock does not come with its own Lightning cable, meaning you’ll need to use the one shipped with your iPhone. Apple’s dock ships in three different colors to match the three colors of the iPhone itself: space grey, silver, and rose gold. Like the ElevationDock 3, I tested the space grey version, which matches brilliantly with a space grey iPhone 6s. As mentioned, the dock is very simple, meaning it’s also very light and provides little support for your iPhone. Your iPhone rests on a small, protruding Lightning connector and has no other methods of support. 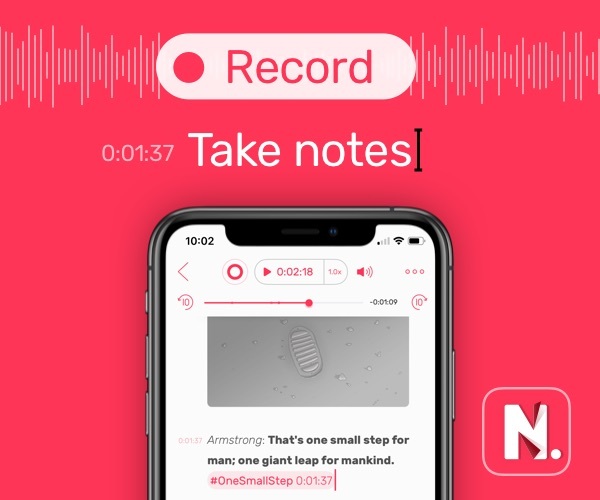 If you try to tap your iPhone and interact with iOS while docked, a simple tap causes the entire dock to tip and may topple over on strong presses (say, if you’re trying a 3D Touch action). This is my biggest gripe with Apple’s own iPhone dock, as it doesn’t provide the support I’m looking for. The back of Apple’s iPhone dock has a line-out jack, just like the Gravitas. This has been standard on Apple’s iPhone docks since they were first introduced. The bottom of the dock is a soft, relatively plush material that picks up lint and dust like the best of them. On the other hand, there should be no worry about the dock scratching your desk or nightstand. That minimalist design does have a few benefits, namely in the dock’s case compatibility. 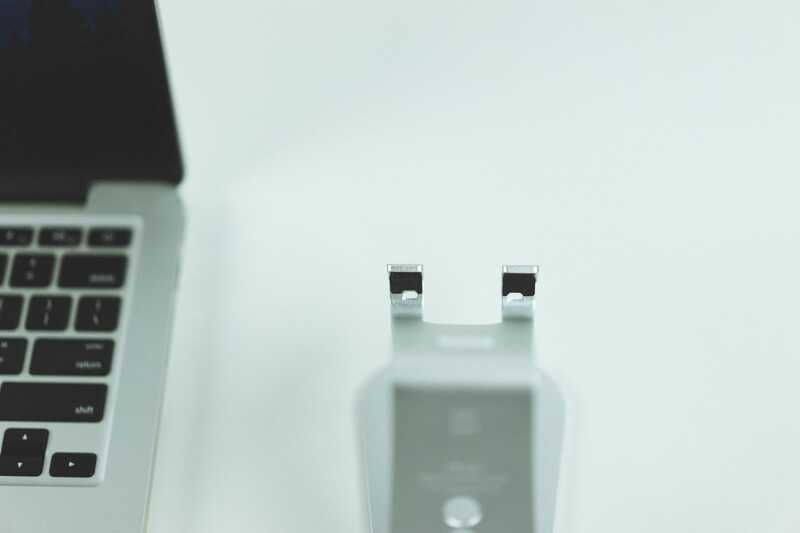 Based on its shape, you can dock your iPhone in any case on the market, as long as the protruding Lightning connector can reach the iPhone’s connector. This is a drastic design change from prior Apple iPhone docks — I have an old iPhone 5s dock kicking around the house (which I now use to charge the Apple Pencil) and it was shaped to the original form factor of the iPhone 5s. This is the first Apple dock to make room for iPhone cases, and this is a design choice we greatly appreciate. All in all, Apple’s own iPhone case has seen some major improvements over prior generations, but it doesn’t stack up next to the more expensive ElevationDock 3 or the Henge Docks Gravitas. For one, the Apple dock doesn’t provide much support for the iPhone when docked, and its new freeing design makes docking and undocking without looking a near impossibility. That freeing design does provide case compatibility though. For $45, you can expect a little give and take, I guess. 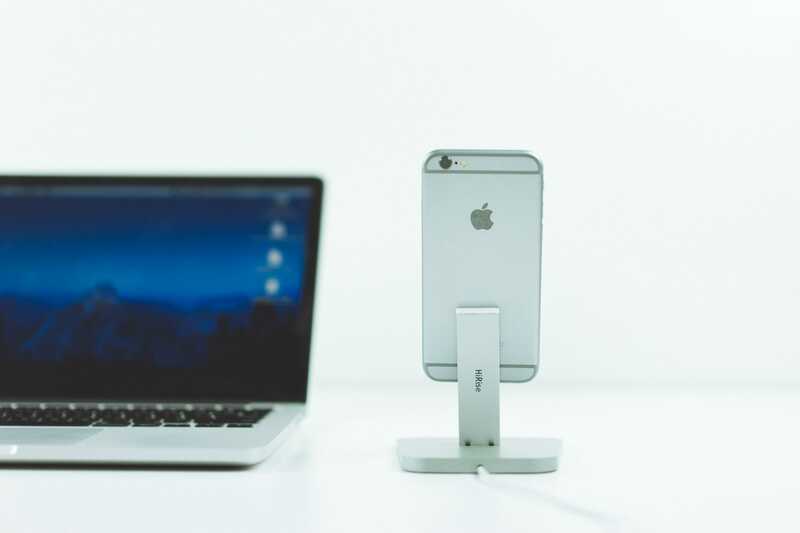 Twelve South’s HiRise Dock for iPhone and iPad mini is a favorite amongst many people. The HiRise Dock boasts many checkmarks on my list of requirements to be the best iPhone dock, but unfortunately, it’s not user friendly to access all these features. Let me explain. 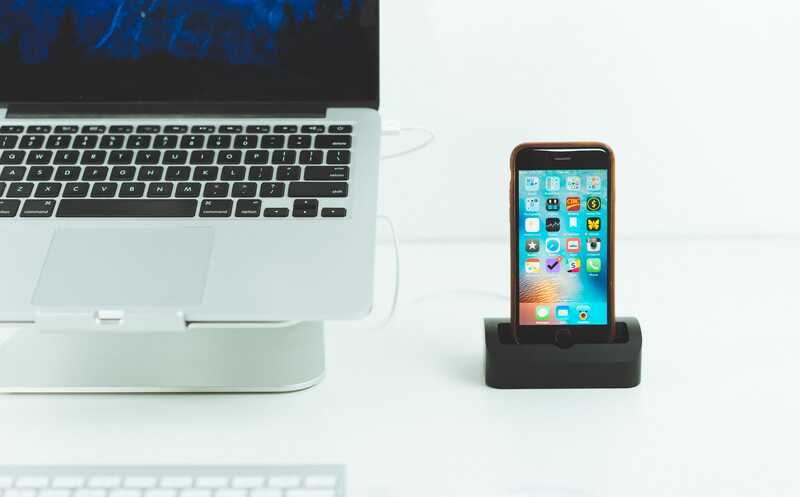 First and foremost, the HiRise Dock raises your iPhone or iPad mini about an inch to an inch-and-a-half above your desk or nightstand, giving better viewing angles when perched on your desk and keeping your iPhone out of harms way. 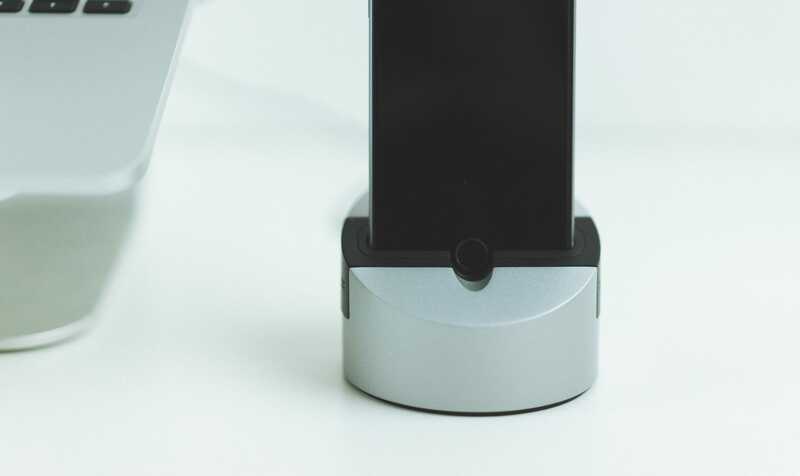 The HiRise requires you use the Lightning cable shipped with your iPhone, and you run the cable through the bottom of the dock and up through the front metal bar. Inserting the cable is easier than the ElevationDock 3, but it still requires some initial setup. The back bar (which says “HiRise” on it) is actually screwed into place with included screws and an allen wrench. As you can see, it’s fairly easy to screw these into place at an incorrect angle. More importantly, how you screw this bar into place sets your experience with the HiRise Dock. It’s easy to put extra space between the Lightning connector and the back support bar to make room for a case, but once this support bar is screwed into place, it’s difficult to adjust the positioning of that back bar. I’m the kind of guy who likes to use an iPhone case only occasionally, so having to screw and unscrew that back support bar is a big nuisance. Now, the back support bar does allow the HiRise to accommodate iPhones with cases as well as iPad minis. This is a handy addition, especially if you want the HiRise on your desk at the office. 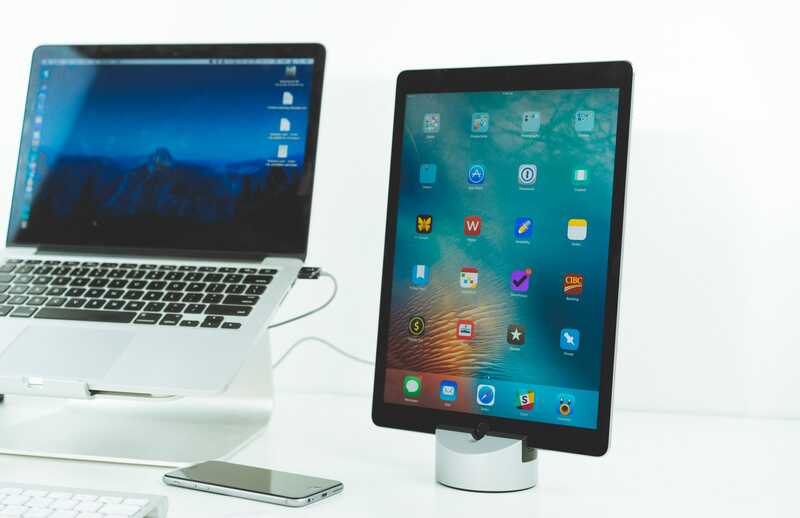 But, just like the Apple dock above, the freeing design that accommodates an iPad mini makes this dock difficult to use without looking or in the dark. I’ve spent upwards of 30 seconds sometimes trying to properly dock my iPhone late at night, and I can’t tell you how often I’ve woken up my wife in the process. Lastly, the HiRise’s weight is substantial enough to undock your device with only one hand. Generally, you have to use your second hand to hold the base of the dock before undocking, or you have to grip your iPhone with one hand in such a way as to wedge it off the dock connector. 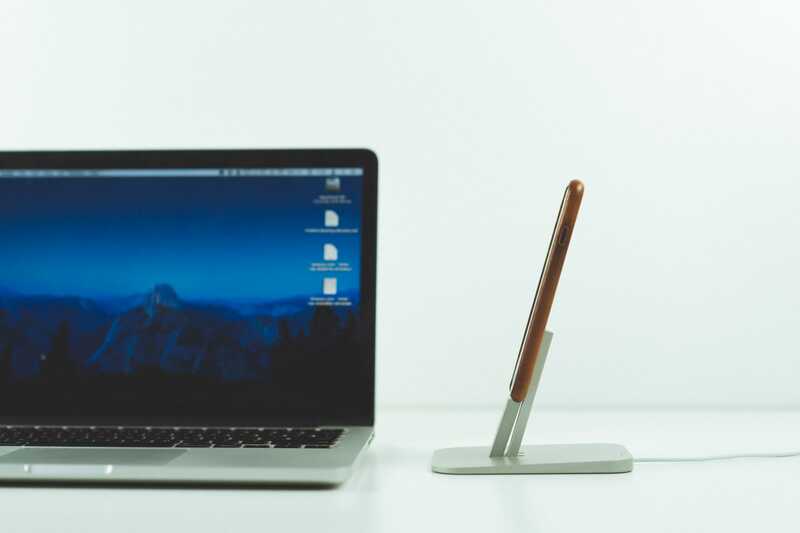 Twelve South’s HiRise Dock really is a good option, especially given its price. At $35, this is one of the least expensive options on this list. 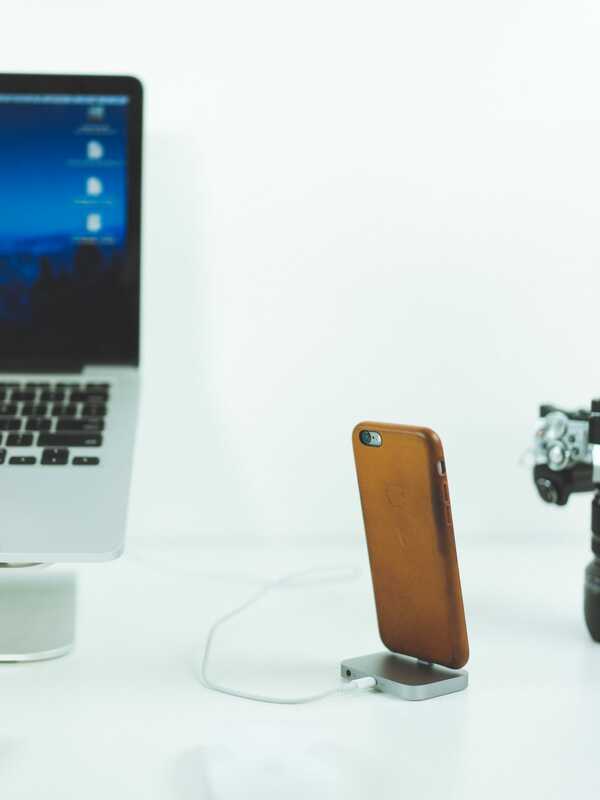 The HiRise provides a nice pedestal for any iPhone — with or without a case — to be docked, and the simple aluminum design looks great on a desk with other Apple-related products. However, the lightness of the dock makes for a less enjoyable undocking experience, and having to adjust that back bar for different cases or for a naked iPhone is more effort than I’d like to put in. Plus, you have to give up your precious Lightning cable. I’m not entirely sure which category the Elago M2 Stand falls into. For one, it’s nothing more than a piece of aluminum that provides a more elegant stand for resting your iPhone. Two, how it handles cables makes me wonder if this is more a stand than a dock. Either way, I’m left enjoying the design of the M2 Stand, but flat out disliking its capabilities as an iPhone dock. 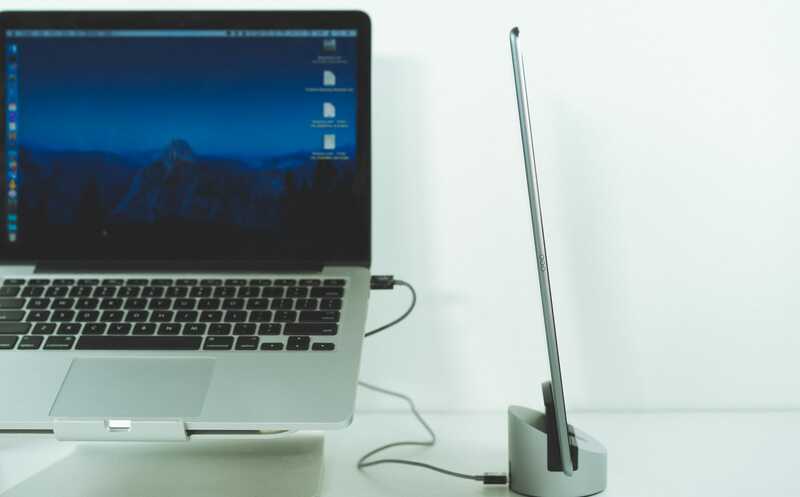 The M2 Stand looks and feels a lot like a mini Rain Design mStand for MacBooks. 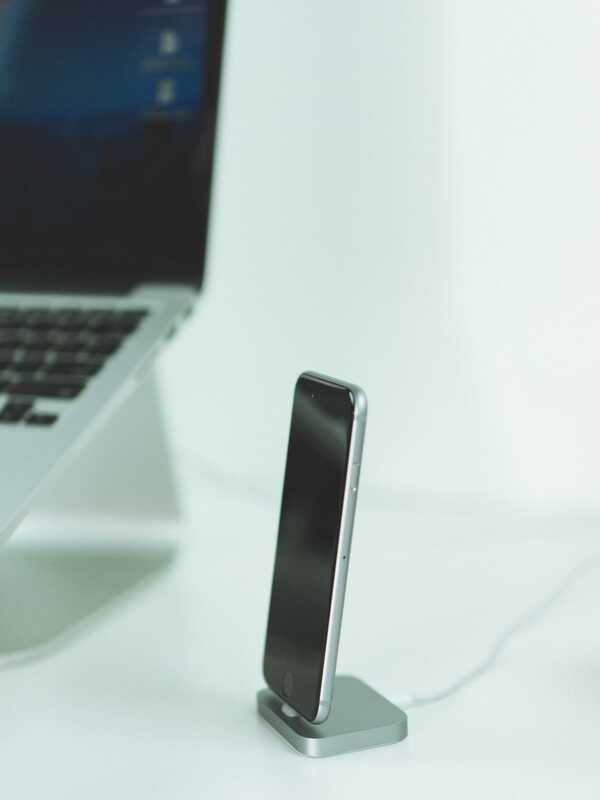 It hoists your iPhone into the air and provides a consistent pedestal design across your desk. 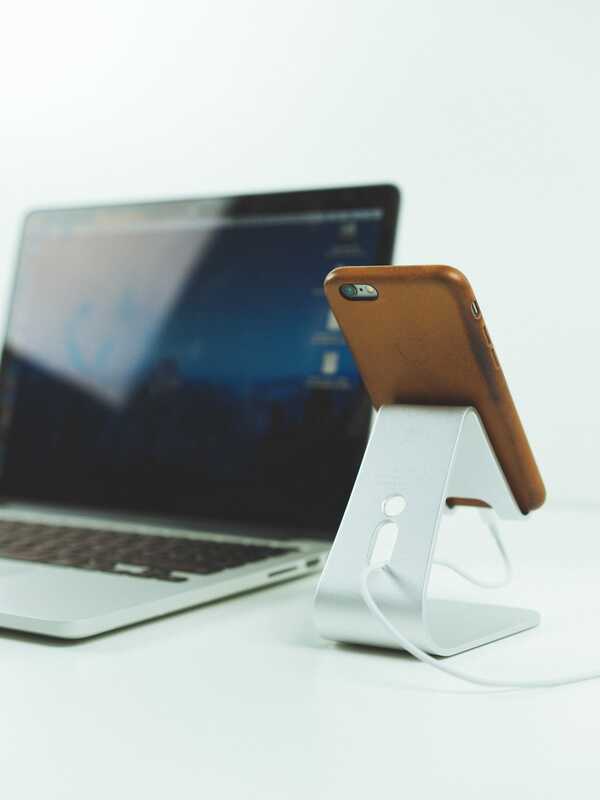 The stand is extremely light, making for easy bumps and tumbles when you try to rest or pick up your iPhone from the stand. The back of the M2 Stand has cutouts to run your own Lightning cable for charging. Unfortunately, there’s no way to make your Lightning cable stationary, meaning once you unplug your iPhone, the Lightning cable will dangle there until you plug back in. Other docks have a more tidy approach to inserting your own Lightning cable. This could point to the M2 Stand being exactly that: a stand. Nothing more and nothing less. However, in comparison to the other docks on this list, how the Lightning cable is handled is a major pitfall. Much like the Rain Design mStand, the inside of the holders and the front face have silicone bumpers to eliminate friction between your aluminum iPhone and the aluminum M2 Stand. The holders actually appear to be a bit wide for the iPhone 6s, making for an even less supportive stand. Most odd, though, is the angle at which your iPhone sits when resting on the M2 Stand. Perhaps the M2 Stand is meant to be placed off to the side of your mouse or keyboard and closer to your chair when you’re sitting at a desk, because the surprisingly low angle is not ideal for placing away from your chair. It’s both difficult to view properly and hard to use when docked, especially if you have your iPhone plugged in. All in all, the M2 Stand is one of the poorer choices on this list. 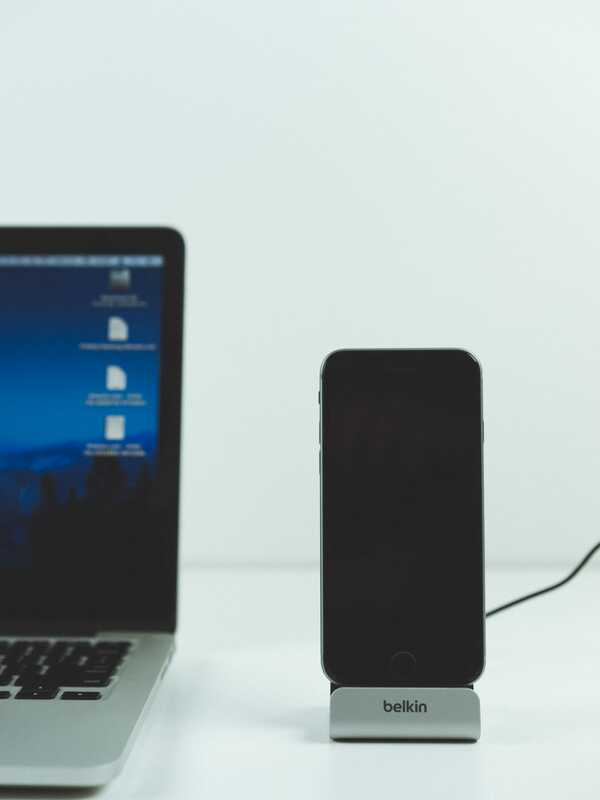 This may be because it was never designed to compete with other docks, rather choosing to be a minimalist approach to resting your iPhone on your desk. In relation to other docks though, the improper handling of a Lightning cable and the stand’s light weight make for a less than ideal docking experience. 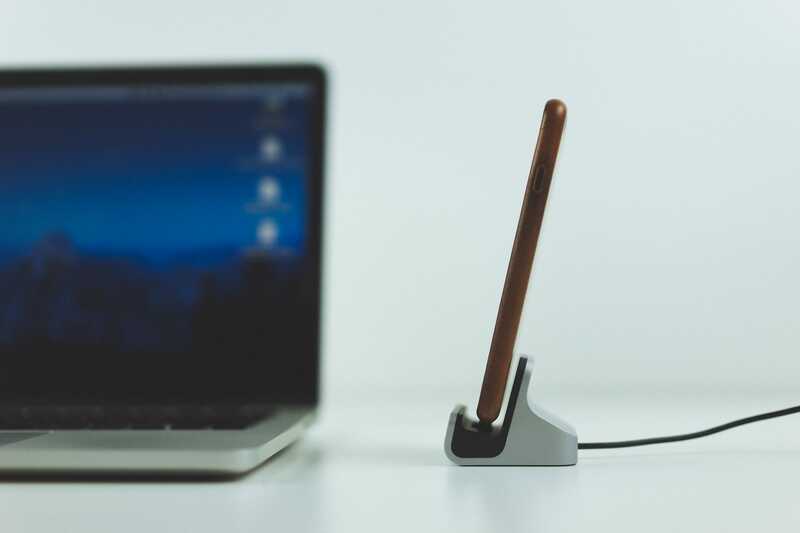 For $18 though, you could pick one of these up solely for resting your iPhone on your desk in a flashy fashion and never choose to plug your iPhone in when on the M2 Stand. 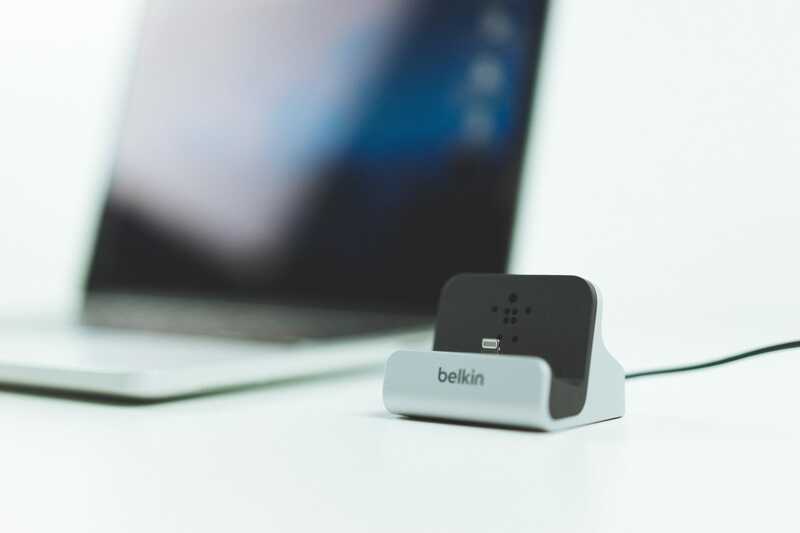 The Belkin ChargeSync Express Dock is a better docking option than the Elago M2 Stand if we consider the M2 Stand as a dock. Otherwise, the Belkin ChargeSync Express Dock is one of our last choices on this list. 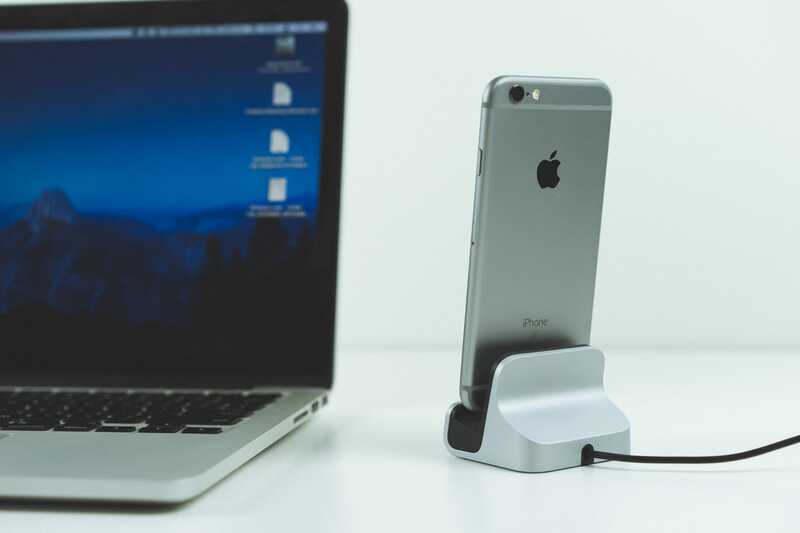 For its price tag, you could pick up the Twelve South HiRise Dock instead and have a much better experience. The Belkin ChargeSync has that seemingly standard Belkin design. It’s neither frivolous or minimal, making for a very standard, generic look. It won’t win or lose any awards on the visual aesthetic front. 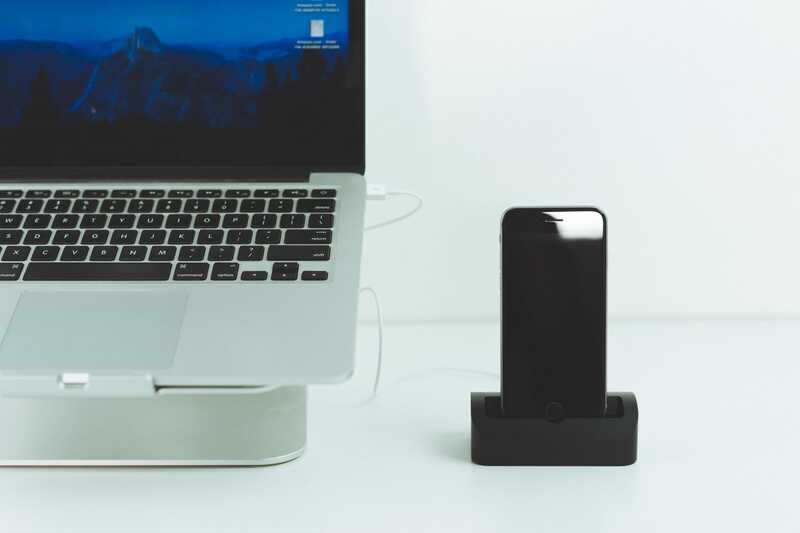 The ChargeSync comes with a built-in Lightning cable, which is this dock’s high point. The cable is black, a color I always find to be more inconspicuous on a desk. Like its design, this will help the dock go unnoticed. For me, the ChargeSync falls apart in its support for your iPhone. As you can see above, the iPhone doesn’t actually rest on the back angled support, meaning all stress is on the Lightning connector itself. At first I thought this overly large gap was necessary to accommodate a standard case, so I put on the Apple Leather Case to try it out. To my surprise, the iPhone still didn’t rest against that back angled support. No matter how you slice it, the dock is too wide for an iPhone 6s and would make me worry about unnecessary bending or stress on both the dock’s Lightning connector and the iPhone’s Lightning port. When glancing at my above checklist, there aren’t many boxes being checked off here. The ChargeSync doesn’t provide any support for your iPhone and it’s too light to make undocking a one handed experience. Thanks to its wide design, docking an iPhone without looking would be very difficult and there’s also no line-out audio jack to hook up to a speaker system. On the plus side, the ChargeSync does come with its own built-in Lightning cable, so you won’t be needing your original cable. To top it all off, though, is the ChargeSync’s price. The ChargeSync sells for $33 currently on Amazon, which is two dollars shy of the vastly superior HiRise Dock from Twelve South. For an extra $2, you get a better visually designed dock, as well as more support and better case and device compatibility. You will, however, need to supply your Lightning cable, so there is some merit to the ChargeSync if you need to keep your Lightning cable for other purposes. At the top, I admitted I had a love for iPhone docks. No matter what, I have felt a dock is as important — if not more important — than an iPhone case. However, I was never too opinionated about docks. If it raised my iPhone up and off the surface of my nightstand, I was happy. Things have changed. After testing a wider variety of docks, I now know what I like and what I don’t like when it comes to these simple accessories. For one, I’m a huge fan of being able to undock quickly and easily without using both hands. I’m also concerned about a dock’s future with the iPhone 7, 8, and beyond. I would wager I’m fairly representative of other people as well, as my use for an iPhone dock isn’t extraordinarily odd or anything. For those reasons, the ElevationDock 3 is the dock I think most people would be happy with. It’s large and heavy, making for a pleasant undocking experience. Its cutout is large enough for both the iPhone 6s and 6s Plus and the nifty silicone strip is a great way to accommodate for thicker iPhones with a case. Further, thanks to those silicone bumpers, you can rest assured knowing your iPhone is protected from the aluminum body. I also think those silicone bumpers will help accommodate whatever size and shape of iPhone Apple releases in the future. If the ElevationDock 3 had a hard plastic insert like the Gravitas, I’d worry about the lack of wiggle room needed to dock a future iPhone. Instead, I can’t see there being any major issues come September of this year. And hey, the ElevationDock 3 looks the part as well. The matte black ElevationDock 3 with a space grey iPhone 6s is a killer combination. I’d also recommend the Henge Dock Gravitas, as the extra weight of the 2.5 pound Gravitas makes for the ultimate docking and undocking experience. The only reason I give the ElevationDock 3 the extra thumbs up is because of those silicone bumpers — they provide that extra support and safety I’m looking for in my everyday dock. And lastly, if you’re looking to save a few extra bucks, you can’t go wrong with Apple’s own iPhone 6s Dock or the Twelve South HiRise Dock for iPhone and iPad mini. 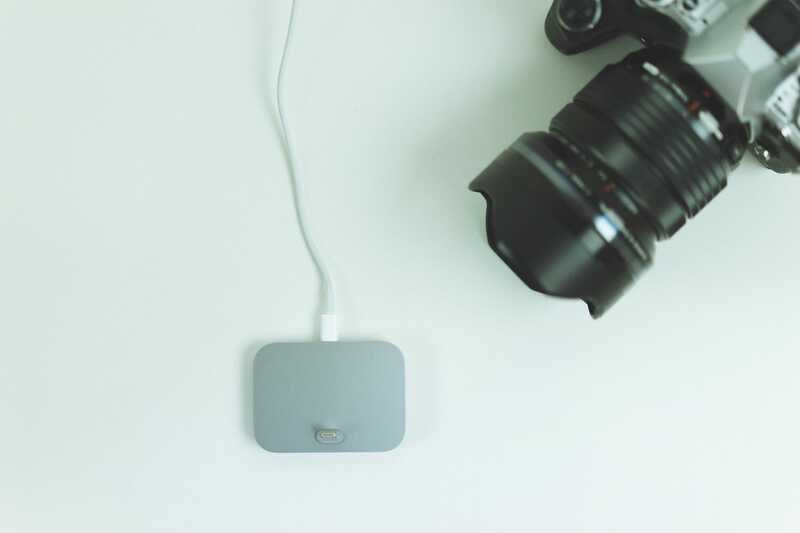 I’d tend to lean towards the Twelve South dock thanks to price and its ability to accommodate an iPad mini, but Apple’s extremely minimal design will speak volumes to some people. In the $35 to $45 range, you can’t go wrong with either of these docks. Every time I write a roundup review of accessories for The Sweet Setup, I come away more opinionated than ever. Thanks to the ElevationDock 3 and the Gravitas, I’ll never buy a simple, inexpensive dock again. 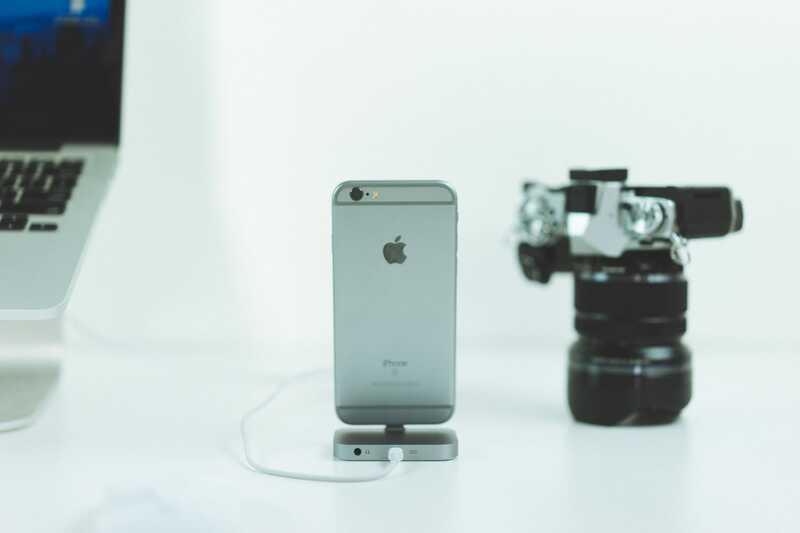 iPhone accessory makers really do create great products with great experiences, and the top two to four choices on this list prove how much better your iPhone can be with a few extra purchases along the way. The ElevationDock 3 is our favorite iPhone dock because of its excellent design aesthetic, build quality, and functionality. 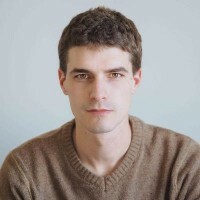 Josh Ginter is the Reviews Editor and Deals Editor for Tools & Toys. He's also a studying accountant and blogs about photography, travel, and other cool things at The Newsprint.